It was gut check time at the start of the third period. 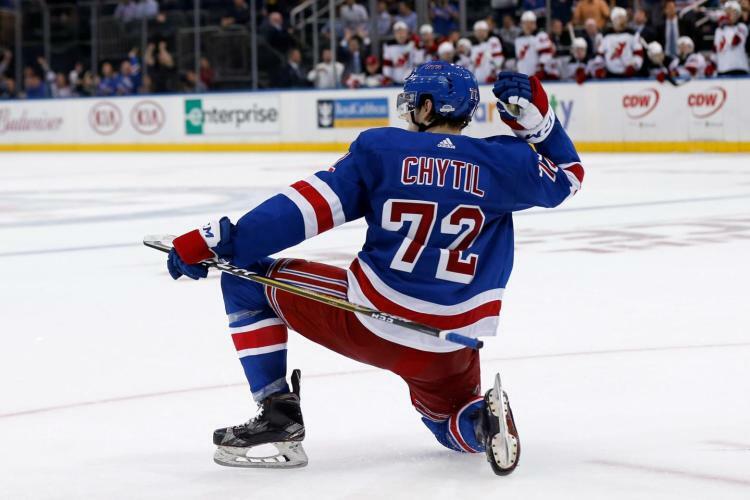 After the NHL’s best Caps had rallied with two goals in the second period including a controversial reversal from Toronto that credited Jay Beagle with a goal followed by T.J. Oshie’s power play rocket, the Rangers showed character by getting the only goal off the stick of Mr. Clutch Derek Stepan 17 seconds into the third to post a heartfelt 3-2 win over the Caps at Verizon Center. They did it with big saves from popular backup Antti Raanta, whose biggest came when he dove on top of a loose puck just covering it up at the goal line before it crossed to preserve a one-goal lead. The Finn with the cool personality won his third straight decision making 32 saves against one of the league’s best offenses. He turned aside all 11 shots in the third and was named the game’s second star. Even better, he and his teammates showed good poise following the goal controversy in which neither referee Jean Hebert nor Chris Lee made a call on the ice during a wild sequence in Raanta’s crease. At the time, the Blueshirts led by two on first period tallies from Jesper Fast (9th) and Keith Yandle (power play goal). Predictably, the Caps carried much of the second with their aggressive forecheck out-shooting the Rangers 15-11 while outscoring them 2-0. It was the Caps’ bottom two lines which sparked the comeback. The third line in particular of Marcus Johansson, Jason Chimera and Tom Wilson were very effective on the cycle generating chances. But it was the fourth line centered by Mike Richards that broke Raanta’s shutout in odd fashion. Following a Richards shot that Raanta stopped, a maze of players battled for a loose puck. Kevin Klein looked to have prevented a goal with a nice defensive play. But Beagle was able to get a shot on Raanta, who was on his back trying to cover the puck. MSG’s replays showed no definitive evidence of it crossing the line. After they went to commercial, Toronto finally finished reviewing the bizarre play and ruled that the puck crossed the line for a Washington goal. Of course, Alain Vigneault and the Rangers bench protested. But their goalie interference challenge resulted in the goal being upheld and a loss of a timeout he wouldn’t have used anyway. Beagle was credited with an unassisted tally. It was also the Cap’ fourth line with another good shift drawing a slashing minor on Tanner Glass which led directly to Oshie’s game-tying power play goal. The Rangers once again allowed a goal in the final minute of a period. A notoriously bad second period team, they blew a shorthanded chance. After Stepan’s shot pass for Viktor Stalberg missed wide, Oshie came down the other way in transition and blew a wrist shot past a screened Raanta tying the game 2-2 at 19:20. Both Caps’ goals were unassisted. Even though they had shutdown Alexander Ovechkin, the Rangers found themselves tied entering the third. But as Stepan put it in the MSG post game to John Giannone, they would’ve taken that against the league’s leading team. It was his goal only 17 seconds in that was the game-winner. On a pinch by Ryan McDonagh, Stepan skated into the slot and fired a shot that took a favorable carom off Brooks Orpik past Braden Holtby for his 15th. A fortunate bounce as he called it. But that’s what we have come to expect from Stepan. Mr. Clutch has a knack for it. Just ask the Caps about Games 5 and 7 last Spring. Playing a second game in two nights, the Rangers had a good start outscoring the Caps 2-zip in a strong first. Vigneault put Chris Kreider back with Stepan and Jesper Fast. It worked to perfection. Off a strong Kreider forecheck behind the net, Stepan helped find Fast for the game’s opening goal at 5:47. Dan Girardi and McDonagh were credited with the assists. Not sure how Stepan didn’t get one. I guess he didn’t touch the loose puck off a broken play in which the Caps defended poorly. Fast beat Orpik to the spot and beat Holtby upstairs. A hard working goal by Quickie. A Karl Alzner trip of Stepan resulted in Yandle’s power play goal. This one was all Kreider. Using his size to distract Holtby, he screened him three different times. The first two resulted in goalposts. The third resulted in Holtby unable to pick up a perfect Yandle laser that made it 2-0 at 16:37. Derick Brassard and Stepan notched helpers. The Caps rallied in the second thanks to some help from Toronto. If only we could’ve had their angle that ruled it a goal. The fact neither official made a decision doesn’t sit well. It should be mandatory that they make a call. Then the near miss by Stepan and Stalberg resulted in Oshie tying it. You just can’t take risks shorthanded against the Caps’ power play. They make you pay. In five games, they scored six PPG’s in the season series. The third was a gutsy display by the Rangers. Stepan got the go-ahead and they kind of sat back. But the Caps only got a couple of good chances with Raanta able to make the key stops. The Rangers did a better job protecting the one-goal lead in the final minute for a character building win. It was a great way to bounce back from the 4-1 debacle at Pittsburgh with Marc-Andre Fleury making an unnecessary comment on Henrik Lundqvist. A big two points to get. They are now five up on the Islanders, who visit MSG Sunday for a special 5 PM start. That should be good. This entry was posted in Battle News. Bookmark the permalink.